BONX, the Japanese technology company founded by avid snowboarder and outdoorsman Takahiro Miyasaka, is proud to announce its formal entry into the U.S. and Canadian for outdoor enthusiasts. BONX is a revolutionary communication device that allows active users to be in touch clearly with no area limitations. Successfully crowdfunded in late 2016, BONX Grip is a state of the art Bluetooth earpiece that enables cellular network-based group communication with up to 10 users – anywhere in the world. This BONX Grip product predominantly targets outdoor athletes and adventurers across running, snow sports, biking, cycling, fishing, climbing, airsoft and more. BONX Grip is a hands-free, Bluetooth earpiece connected to an original smartphone App, allowing users to switch between personal music and incoming calls with one single touch. 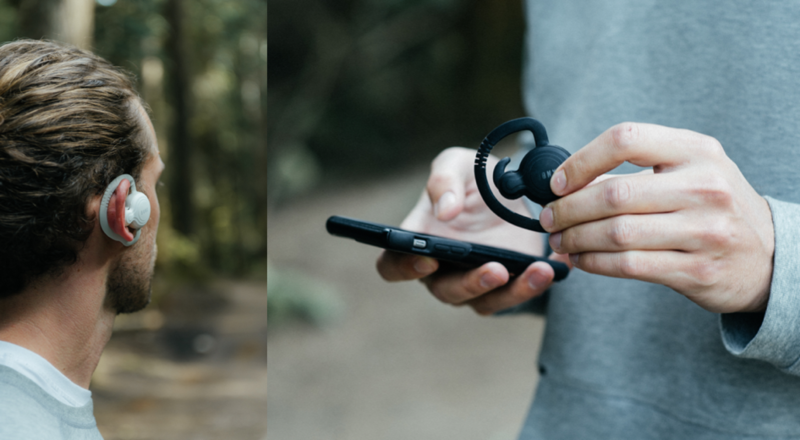 The device is water resistant, shock resistant and made to ‘grip’ the ear, staying put during rigorous outdoor activity. Dual microphones with multi-layer wind and noise reduction technology ensure crystal-clear speech, and only transmit voice when a user speaks, preserving battery and minimizing cellular data usage. The open-back earphone ensures safety in all environments by allowing the user to hear surrounding noise. Each unit is equipped with multiple size earbuds delivering ultimate comfort and functional performance. BONX Grip may be purchased via the brand new www.BONX.co global website and at select retailers worldwide. BONX Grip is available in four colors and retails for $139.95 USD.